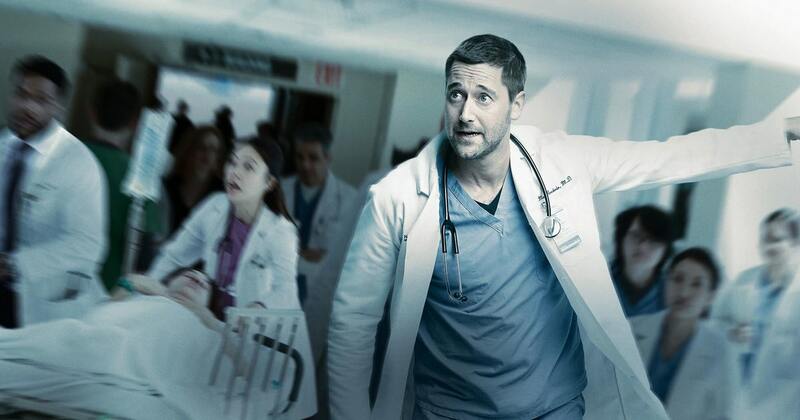 New Amsterdam is one of the best new medical dramas of the season, and this is certainly not an understatement. The story is deep, there is an emotional connection that is unlike anything else, and each week continues to surpass expectations. In fact, while other medical dramas focus on the ridiculously good looking doctors, the drama, and essentially anything but the medicine, New Amsterdam focuses on the emotional aspect without all the extra noise. It brings you into the story in a way that other medical dramas fail to. And it’s precisely why we tune in every sing week to see what the new episode will bring. This week’s episode, ‘Boundaries’, presents a challenge for New Amsterdam and thanks to Dr. Max Goodwin (Ryan Eggold) everything turns out okay in the end. Well, Max did accept the challenge without thinking twice but then handles it like the champ he is. The episode begins with him waking up on the couch in his pregnant wife’s home. It’s a complicated situation but the two are finding a way to make it work. Max sees Georgia (Lisa O’Hare) trying to assemble the crib because sitting idle isn’t exactly doing well for her boredom. She tells him she wants to desire him again but she’s simply not there yet, and Max, being the gentleman he is tells her he has all the time in the world. As Max jogs to work later that morning, he sees a homeless woman sitting outside the hospital with an infected foot. He tries to offer her free treatment but she refuses. The scene switches to inside New Amsterdam as Dr. Frome (Tyler Labine) conveys his excitement about getting funding for the hospital’s planned community garden, while Dr. Kapoor (Anupam Kher) brings in Indian sweets called laddu for a woman he’s crushing on. This becomes quite the joke throughout the episode as everyone gives him their feedback about whether or not he should give them to her. Seeing the passion that Max has for patients without being blinded by dollar signs (a big part of Fox’s rival medico-drama The Resident), is so endearing and inspiring. Knowing that this all stems from a true story makes everything about ‘Boundaries’ even more meaningful. Every patient encounter Max has is a testament to why New Amsterdam is such a unique medical drama, and this week’s episode was no different. Dr. Frome is in for a rude awakening when he realizes that Volt Cola is the sponsor for his garden funding and he can’t accept their money knowing what they represent. Dr. Sharpe (Freema Agyeman) begins the process for Max’s radiation treatment which starts with creating a mask that looks rather frightening and suffocating. Getting this mask fitted was the most difficult thing as Max’s pager kept going off – which he later learns is because all the cardiovascular surgeons are out of town for a meeting and there’s an extreme shortage as a result. New Amsterdam only has one surgeon who stayed behind, while Baptist has no-one left, so all the cases overflow into New Amsterdam with Max’s approval. Getting everyone on the same page, Max calls for a meeting with all the department heads to inform them of the game plan. Dr. Bloom (Janet Montgomery) is in charge of the emergency department and allocating patients accordingly. But all the while, she keeps asking who took her ibuprofen which is really just a bottle of Adderall that she needs to function at work. Seeing Max take on such a huge task is overwhelming, but his confidence and passion seem to reassure everyone that it will be okay. Dr. Floyd (Jocko Sims) is the only cardiothoracic surgeon on hand but the emergency department is rapidly filling up. It doesn’t help that he refuses to let any other doctors operate because he doesn’t want anything to get screwed up. In the midst of the madness, Max goes back outside to see how the homeless woman is doing with medicine in hand. He convinces to her to let him treat her free of charge, and she then tells him that her brother is very ill and needs medical attention. Leaving the chaos of the hospital behind, Max follows her and checks up on the brother who is barely breathing but does not want any medical attention because they think the hospital will charge them despite Max’s promises. It’s hilarious to watch Dr. Kapoor in ‘Boundaries’ as he tries to treat a patient who can’t describe what dizzy means to her. He refuses to help her until she can describe what is going on and he doesn’t falter on this even though she is flustered by his behavior. Eventually, she describes a numb feeling in her feet and Dr. Kapoor instantly diagnosed her with Guillain-Barre syndrome. Watching Dr. Kapoor in these moments is a bit jarring at first because as a viewer we just want him to help the patient, but as we come to see, he knows he can help but he wants the patient to be a part of the diagnosis. Rather than being a smartass physician, he wants to take his time to truly help which is not always the case in medical dramas. Remember the homeless woman and her sick brother? Well, they come rushing into the hospital and Max learns that he has a fungal infection in need of treatment. At this point, Max realizes that he has bitten off more than he can chew and doesn’t hesitate in confessing this to the department heads. He gives them all their individual tasks and tries to divide patients to other hospitals so the burden on New Amsterdam is reduced. In what is a rather emotional episode, there is some joy and happiness when Dr. Frome decides to start creating a garden up on the rooftop. Everyone joins him in this venture and a stressful, chaotic finds its way to some therapeutic relief in the garden. Dr. Sharpe reminds Max that they are to start his radiation and chemo in a couple weeks and he should take this time to really focus on himself. One aspect of New Amsterdam that pulls viewers in from week to week is the balance of devastation and tragedy versus hope and optimism. It’s not rainbows and butterflies all the time, but it’s not all gloom and doom either. It’s such a welcome change to see a medical drama step away from the on-call room hookups to a story about a doctor that just wants one simple thing – to help his patients. ‘Boundaries’ is infused with moments where hope seems like far-fetched idea, but with the simple idea of a garden the entire mood of chaos and stress withered away, and the characters got a moment of peace and serenity. New Amsterdam is truly such a pleasure to watch from week to week, and the stories it possesses have a way of inspiring and uplifting us. It’s already been an emotional ride with just four episodes, and given that Max is about to start chemo and radiation, it’s only going to continue. Eggold does a wonderful job portraying Dr. Max Goodwin and conveys a realism and honesty to his character that is undeniable and addicting. In the coming weeks, it will be riveting and thrilling to see where the story goes, and how Max faces the adversity that will come with his treatment. Florida born, AZ native. Future optometrist. TV show addict. Avid nerd convention attendee. All wrapped up into the girl known as Reebs. Check out my blog, WatchWithReebs, for reviews, recaps, and more! Star Trek: Discovery: Season 2 – Worth Discovering? This season sees the crew discover whether there's still material to be squeezed out of the original series. Everyone thought the final season would be explosive from the off. It's given us a slow burn instead. Even in the face of having to barter for supplies and their own personal demons, New Amsterdam hangs tough.